So Belle Favors created decorative chocolate favors for a Bat Mitzvah for a special young lady named Amanda who loved the rainbow colors they were decorated in. The chocolate favors were used as place cards for all the attendees of the party. She had wrote each family and guest´s name on the chocolate gifts as a personal touch. The party guests were very impressed by the chocolate place card party favors that were neatly displaced on a table as guests entered into the celebration. 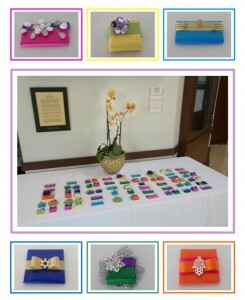 The Bat Mitzvah chocolate favors order was for 68 pieces that were created with 18 unique designs using bright rainbow colored wrapping paper and fine ribbons. The embellishments were a combination of crystal flowers, Star of David, Hamsa hand, crystals and pearls. These elegant theme party favors were a great addition to the Bat Mitzvah party and will be remembered for years to come.